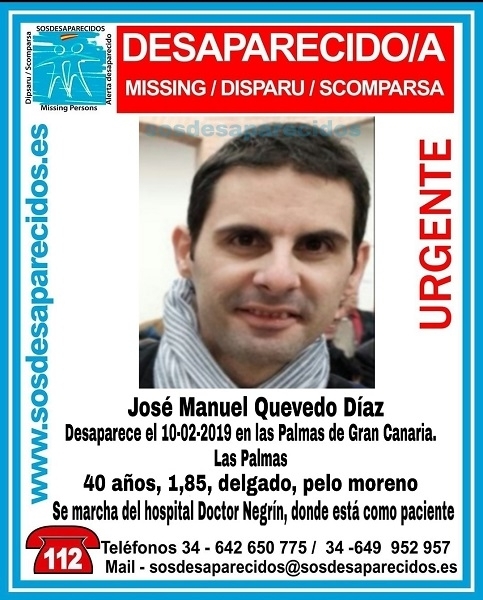 In Las Palmas, 40-year-old José Manuel Quevedo Dìaz, who was being treated as a patient at the university hospital Doctor Negrín, was reported missing on Sunday. The man is 1.85 metres tall and slim. He has dark hair and disappeared directly from the hospital. If you have any information about his whereabouts, please call 642 650 775 or el 649 952 957. Produced with news.CMS in 0,0794 seconds.